[I]t is hard to see why the president of the United States believes so strongly in the likelihood of brokering a peace deal between a weak Israeli government and a Palestinian Authority that exists largely on paper and has no obvious means of future support. . . . It is rude to say that the Palestinian Authority is a fiction and that a peace treaty signed with an imaginary entity would be a joke. It is rude to say that there is no immediate solution to the Israeli-Palestinian conflict. Because it is rude to say these things, it becomes difficult -- if not impossible -- for reporters and editors to think about why the president is here. . . . If the occupying Israeli army disappeared from the West Bank tomorrow, it is doubtful that [Abbas] would last more than a few months. . . .
A sharp glimmer of understanding penetrates my foggy brain. The Americans and the Israelis speak with such assurance about reaching an agreement by the end of 2008 because they are talking about a paper agreement with a paper partner to create a state that will only exist on paper. . . .
No one believes the badly fractured Palestinian polity is capable of meeting its commitments. Which means that most Israeli troops and settlers will stay more or less exactly where they are today. All three of Samuels’ articles are worth reading in their entirety. The long-awaited second report of the Winograd Commission will be issued in Israel today, focusing on the conduct of the Second Lebanon War, particularly the disastrous ground invasion in the final days. Now, a year and a half later, veterans of the war are demanding that Prime Minister Ehud Olmert accept responsibility for its conduct -- or risk unraveling the consensus on which Israel's survival depends.
. . . Israeli forces were denied permission to invade Southern Lebanon and neutralize the katyusha rockets that were pummeling Israeli cities. . . . Only on Aug. 13, after a month of fighting and with a U.N. ceasefire already approved, did the government authorize a ground offensive into Lebanon. The operation achieved nothing, either militarily or diplomatically, and cost the lives of 33 Israeli troops. . . .
Israel lacks a constitution but is bound by an unwritten social contract. . . . Prime Ministers Golda Meir and Menachem Begin resigned in the aftermath of disappointing wars, though both were exonerated of incompetence. By ignoring these precedents, Mr. Olmert, whose culpability began before the war, when he appointed a defense minister devoid of military experience, threatens to break the contract. b. The Prime Minister made up his mind hastily, despite the fact that no detailed military plan was submitted to him and without asking for one. Also, his decision was made without close study of the complex features of the Lebanon front or of the military, political and diplomatic options available to Israel. He made his decision without systematic consultation with others, especially outside the IDF, despite not having experience in external-political and military affairs. In addition, he did not adequately consider political and professional reservations presented to him before the fateful decisions of July 12th. c. The Prime Minister is responsible for the fact that the goals of the campaign were not set out clearly and carefully, and that there was no serious discussion of the relationship between these goals and the authorized modes of military action. He made a personal contribution to the fact that the declared goals were over-ambitious and not feasible. All of this was on top of the disastrous Gaza disengagement -- of which Olmert was the chief sponsor and cheerleader. UPDATE: Israel Matzav (Carl in Jerusalem) is live-blogging the release of the Winograd Report. If the first report was insufficient for Olmert to resign, the second will not be sufficient either. Michael Oren is the guest today on the excellent weekly ZOA Middle East Report, hosted by Lori Lowenthal Marcus and Steve Feldman, on WNWR 1540 AM at noon EST (listen live or later here). 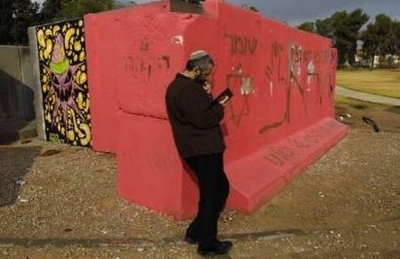 An Israeli man prays as he leans against a concrete shelter in the southern town of Sderot January 23, 2008. Reuters (Amir Cohen). On Thursday, January 17th I went to Sderot. Russian Jewish Community Foundation of Massachusetts, on whose board I sit, is conducting a project in the city -- building a safe-play room and an after-school program for children. . . . There were a few reasons behind my decision -- I really wanted to see the shelter, that was built with hard-earned money of people of the Russian Jewish community of Boston, and I felt that I have to show the solidarity with people of the city. Rick Richman, of Jewish Current Issues, suggested in an open-ed in New York Sun, that our President should visit Sderot to proclaim his solidarity with the besieged city, following the example of John Kennedy in Berlin. My President, my leader, did not go to Sderot, he preferred instead a company of fat Saudi royalties and talked about "occupation". But I had to go. There was another reason that re-assured me. Years ago a mayor of Sderot brought a key from the city to the Lubavitcher Rebbe. The Rebbe accepted the key and said with a smile that this made him an owner of the city. . . . I decided that I have to go to see the situation on behalf of the Rebbe. . . . I drove to Sderot . . . I drove through a normal, developed country, with much better roads than in many places in the states. And then I made a turn to Sderot. There were fewer and fewer cars, and when I came to the city I felt that I drove in on a movie set where they were shooting a war movie. . . . I saw a scene familiar from the news -- a crowd, an ambulance -- Kassam just fell there. . . . I saw the shelter built by my community. . . . I was told by my hosts that the night before there were twenty women in this shelter. . . . Rabbi Fendel told me that Sderot means spine in Hebrew, and that nobody will break it. We drove from place to place, we had to run a few times in response to Tzeva Adom (Color Red). I was told not to buckle up, and be ready to jump out of the car and to run if necessary. . . . Toward the end of the day we met with one family whose daughter was in our camp in Boston last summer. . . . We just sat and talked quietly for a little while. I said that I was there to show my hosts that we cared. They said that they knew it. Upon coming back home and seeing teary articles of the Boston Globe about the plight of Gaza's civil population I thought -- Sderot is undergoing a collective punishment, but Boston Globe and the world refuse to see it. Sderot's citizens are getting shelled every day for no other offense than being Jewish. We can not remain silent or inactive. We all should say together: Ich bin ein Sderoter. Israelis cross an empty street in the southern town of Sderot January 23, 2008. . . . just 1.5 km (1 mile) from the northern border with the Gaza Strip (Reuters: Amir Cohen). Our confidence that there are no permanent enemies also gives us hope that two states, Israel and Palestine, will one day live side by side in peace and security. The Annapolis process will support the bilateral efforts of Prime Minister Olmert and President Abbas to end the conflict between their peoples. But we must not lose sight of what that peace will really mean. Peace will mean that Palestinians will never again suffer the humiliations of occupation and wasted hours spent in checkpoints -- and will instead be free to work and prosper in a state of their own. Peace will mean that Israelis who have so justly and proudly defended the Jewish state for the past 60 years will finally see their right to exist affirmed and accepted by their neighbors. And peace will mean that the hatreds borne of this now 60 year-old conflict will pass away with this current generation, not be passed on to infect new ones. Yes, that is what “peace” would mean, but what Rice has in mind is not peace but a “peace agreement.” It is as if she were speaking hopefully about the Kellogg-Briand Pact -- a project of an earlier U.S. Secretary of State -- and waxing eloquently about what the end of war will mean. At least Secretary of State Kellogg did not propose turning over land to Germany, Italy and Japan to get them to sign their 1928 renunciation of war. Palestinians make their way to Egypt after Palestinian gunmen blew up a section of the border wall between the Gaza Strip and Egypt January 23, 2008. ( REUTERS/Mohammed Salem). Secretary of State Condoleeza Rice is saying that, now more than ever, we need a Palestinian state. I think this is pursuing an illusion. But that is the direction we are going in. We are pressing ahead for an Annapolis conference. And the Europeans are more than willing to follow. What we should be doing is analyzing alternatives to the two-state solution. I don't see a Palestinian entity capable of making and carrying through on commitments. I'd like to see Jordan assume greater responsibility over the West Bank and Egypt over Gaza, which they once governed . . . . Let's be realistic, I think the Palestinians would have better lives as citizens of Egypt instead of pursuing the notion of a Palestinian state. They'd have a better economic and political life. Israeli and American officials were in high dudgeon yesterday over the decision by Egypt to allow tens of thousands, perhaps hundreds of thousands, of Arabs to cross from the Gaza strip into Egypt proper. . . .
Well, let us suggest that what some see as a problem to be concerned about may also be an opportunity to be seized on, because it could be a first step in getting the world to perceive that many of the residents of Gaza are Egyptians rather than Palestinians. 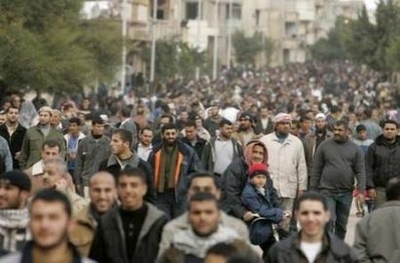 They'd rather be in Egypt than in Gaza, as they showed by voting with their feet these past days. They speak Egyptian Arabic. They have closer family ties to Egypt than they do to the West Bank, where many of them have never even visited. Rather than forcing the Gazan Arabs to join with the West Bank Arabs into a state of "Palestine" that has never before existed and has few of the elements of a successful nation-state, why not let Gaza revert to its pre-1967 status as part of Egypt? What we have seen is a subtle and consistent attempt from the Egyptians not just to avoid having Gaza become their problem, but to ensure that the radical energies emanating from Gaza would always be sent in one direction: Israel.
. . . But today, Hamas just blew the border fence down. Suddenly, some of the pressure that has built up in Gaza over the past several months has been released, and it didn’t go toward Israel -- it went into Egypt, and now the Egyptians are faced with a calamitous situation. Egypt has been hoisted with its own petard, and it is really quite enjoyable to see from a strategic perspective. Hamas probably blew up the border fence with explosives that Egypt allowed it to smuggle into Gaza. 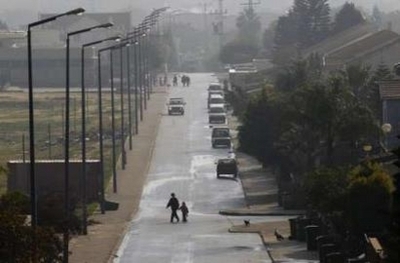 From now on, let Egypt provide Gaza with electricity. For more on this, see Anne Lieberman's excellent post and JLichty's great comment on it. When Al Gore chose Joe Lieberman as his running mate, a shul-mate remarked that it was a great day for the Jews in America that Gore had the courage to do so. I told him that, while I was tribally exhilarated by what Gore had done, he would not have picked Lieberman if the polling had ruled against it. It was a great day for the Jews in America, in other words, because courage was no longer needed. I hear a lot about Obama as a "post-racial" candidate, and I am not sure what this means. . . . "When an African American man is leading a juggernaut to the White House," a vibrating David Brooks asked, "do you want to be the one to stand up and say No?" Well, yes, if "no" needs to be said, and if we are in a place beyond race. Obama is an intelligent, articulate, attractive candidate, exuding youth and optimism, with cadences that echo Martin Luther King, Jr. and JFK. His minimal experience and record make him a blank slate on which people can project their most audacious hopes. Almost alone among the national media, Ed Lasky of American Thinker has noted that, with respect to Israel, Obama has a record worth examining, and associates and advisers that are a cause for concern. In his latest article, “Barak Obama and Israel,” Lasky ably catalogues the accumulating concern about Obama on that issue. In an earlier important article, Lasky caught Obama’s missed moral moment with respect to Israel. It was not a small thing. A third Lasky article suggests that Obama is not a blank slate, but rather a picture that has not yet come fully into focus. Writing in this morning's New York Sun, Hillel Halkin says that "Obama Gets Israel Wrong." In his last three paragraphs, he echoes Lasky's concern. UPDATE: Ed Lasky has another article in the January 23 American Thinker entitled "Barack Obama's Middle East Adviser" -- Robert Malley. There is a pattern emerging. Former Israeli U.N. Ambassador Danny Ayalon has his own qualms: "Who Are You, Barak Obama?" (Hat tip: Ed Lasky). Ruth Wisse gave a masterful presentation at Sinai Temple last week, summarizing some of the themes of her landmark book "Jews and Power." Then she engaged in a fascinating 45-minute colloquy with Rabbi David Wolpe. You can listen to the last five minutes of the colloquy, in which she discussed the public reaction to her book, her views on evangelicals, and her suggestion about the one thing missing from the contemporary Jewish community, by clicking here. Earlier she had some remarks on the reasons (both good and bad) for the renaissance in the study of Yiddish, and some comments (interrupted by applause from the audience) on what she would like to see in Israel-Arab negotiations. Wisse is appearing tomorrow (January 22) at the Jewish Community Center of San Francisco. Information about tickets is here. Philosopher Alasdair MacIntyre tells of King Charles II inviting members of the royal society to explain why a dead fish weighs more than the same fish alive. After a number of subtle explanations were given, the King pointed out that it does not. The story recalls a tale told of the Maggid of Dubnov. Once, a rabbi claimed to a level of scholarship equal to the great Vilna Gaon. The Maggid suggested a test. Two hunters in the woods shoot a large deer, and they call in a helicopter to take it back to the lodge. The helicopter comes in, the pilot gets out, looks at the deer and says "Wow, there is no way we can strap that deer onto the helicopter; it will put way too much weight on it." One of the hunters says "Come on, last year we called in the helicopter and they strapped the deer on and it weighed even more than this one." So the pilot straps on the deer, the helicopter takes off, flies about a mile, and crashes. The first hunter looks at the other one and says "Well, that's half a mile further than they got last year." Ruth Wisse is speaking tomorrow evening at Sinai Temple in Los Angeles at 7:30 p.m. about her landmark book “Jews and Power.” To RSVP, contact Anita Schmidt at aschmidt@sinaitemple.org. FP: Why were Jews so powerful in their ability to adapt [in the Diaspora]? The Jews prospered, as you say, wherever they were allowed to do so. What have been the Jews’ greatest strengths in this context? Wisse: The Bible and the Talmud are the places to begin looking for an answer to this question. The Bible describes how hard it was for that rabble of Jews fleeing from Egypt to become a disciplined people. Take a look not only at the Ten Commandments but at Deuteronomy chap. 28 to see how tough Jewish self-discipline is expected to be. The Jewish way of life was designed to bring out the best in us by restraining the worst. Any people that abides by -- or agrees that it ought to abide by -- the Jews’ covenantal arrangement with God would become as resilient as the Jews. One thing follows from another: individual accountability before the law requires universal literacy, collective responsibility as a people requires communal self-help, keeping the Sabbath cultivates human dignity, putting a curb on aggression against others means that one has to acquire things through other means. . . . The strengths of the Jews derive from the Jewish way of life, and sometimes persist for a generation among those who quit that way of life. Did others covet what Jews attained without wanting to assume their discipline? Yes, from ancient times to the present. Opposition to Jews takes many forms and has many causes of which covetousness -- Tenth Commandment -- is assuredly one. The Book kept the people that kept the Book. [T]he reason that we haven't really been able to move forward on the peace process for a number of years is that we were stuck in the sequentiality of the road map. So you had to do the first phase of the road map before you moved on to the third phase of the road map, which was the actual negotiations of final status. What Annapolis did was to break that tight sequentiality and to say, you can do these in parallel -- you can do road map obligations and negotiation for the final status in parallel. When the peace treaty is done, it will be subject to people having fulfilled their road map obligations in phase one, but you can see how if you're waiting to fulfill the first phase road map obligations you would actually not get to the negotiations of the peace treaty. So that's why Annapolis broke that tight sequence. Who knew it was the Road Map that was the obstacle to peace? The Performance-Based Road Map. Israel, obligated under Phase I only to “freeze” settlement activity and dismantle post-March 2001 “outposts,” instead dismantled 25 settlements in their entirety in Gaza and the West Bank, and withdrew from all of Gaza. The Palestinians, obligated under Phase I to dismantle terrorist organizations and their infrastructure, instead elected their premier terrorist organization to control their government, after the Israeli dismantlement and withdrawal, in elections sponsored by the State Department -- making it impossible for the Palestinians to comply with Phase I. So the State Department decided that the “tight sequentiality” of its own plan was the problem.